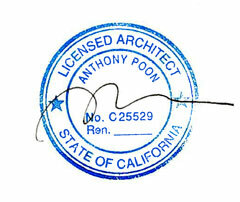 To have a practice as an architect, to legally call yourself an architect, you must be licensed by your state. When I received my license to be a real and true architect, not merely an intern or designer, it was after an excruciating lengthy road of testing—one that involved day-long tests, hotel room interrogation, and paramedics. 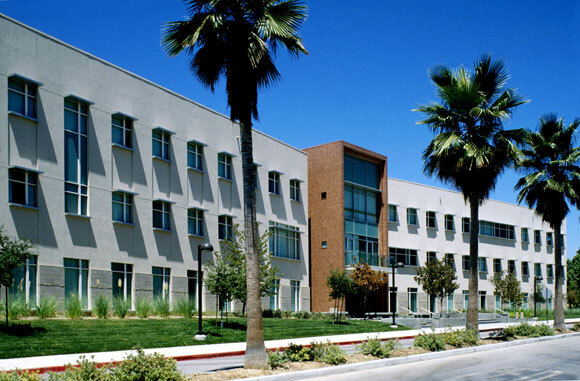 In my day, to be eligible to take the architecture tests in California, one had to complete eight years of accredited architectural education, combined with professional experience under a supervising architect. Having achieved these requirements, I then had to pass eight state exams on subjects such as site planning, contracts, structural systems, and history. Seven of the eight exams were three to four hours in duration, torturous but not daunting. 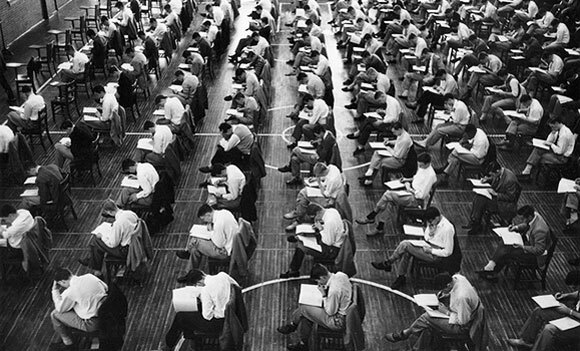 The eighth exam was the big finale–an exhausting, all-day endurance test. This epic exam took twelve hours. Literally. The hopeful architect-to-be was to design an entire building from the ground, up to the big vision, and back down to the details. And the type of building was not revealed until the start of the test. Would it be a church, a shopping center, or a hospital? As I opened up page one of my exam brief, the challenge was to design a two-story office building. Twelve hours is a long time. Time enough to prep and eat a Thanksgiving dinner, or enjoy a drive from San Diego to San Francisco with a stop for lunch. To watch football, baseball and soccer games, back-to-back-to-back. But with the design exam, there would be no overtime. The twelve hours passed as if time accelerated, as if on fast forward, as if one took a plane not a car to San Francisco. For my plan of assault, the first three hours involved understanding the basic parameters of the building: square footage, number of offices, meeting rooms, and restrooms—even the number of toilets—and then outside, the necessary parking for full-size, compact and handicap spaces. For the ensuing six hours, I sketched a range of ideas, testing many options. 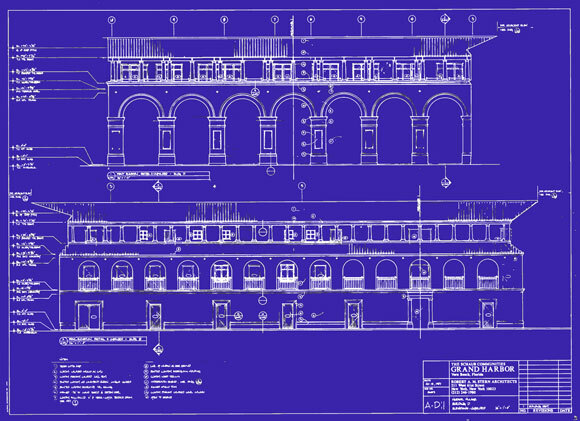 I not only developed the compositional aspects of a handsome building with a civic entry, but also ensured that mechanical rooms were big enough, that the exit stairs would provide ample room to flee in an emergency. Deadline looming, the rest of my time involved drafting the entire design on large sheets of paper. 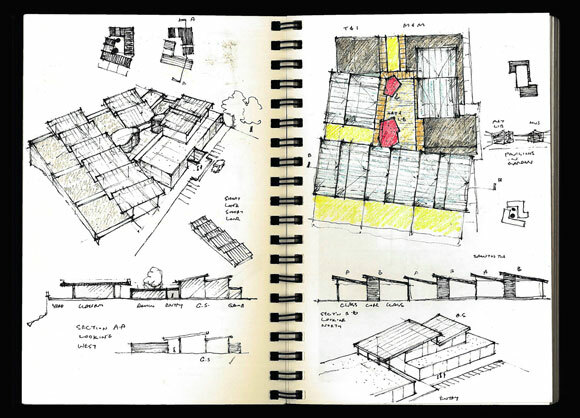 In meticulous detail, I documented the floor plans, roof shape, facades, landscaping—all the dimensions and annotations that described my project. Pencil on paper, my dozens of drawings were drawn by hand, the standard of my generation. No computers back then. This day was no doubt a test of stamina. We came with tools of efficiency and comfort in preparation for what we knew would be mentally and physically demanding. Most of us brought favorite pencils, erasers and paper, while some transported entire furniture arrangements: office chair, drafting table, and even their lucky garbage can. There were no breaks in the twelve hours—no stepping outside for a picnic on the grass. We consumed our food while working at full velocity. When visiting the restroom, we were followed by a guard who stood outside the stall, to ensure that we did not cheat by bringing pre-drawn sketches. Like eating on that fine day, the visit to the restroom was done in great haste, because it was apparent from the start that twelve hours would not be enough to complete the tasks at hand. To top it all off, unbelievably but certainly wisely it turns out, paramedics sat with their equipment next to the mass of want-to-be architects, who filled the entire ground floor of USC’s arena. What could have been a reassuring sight of healthcare only added to our angst. Life and death—that was how the day felt to us career-wise. The last hour was hell, if hell and its associated torment could be used to describe a mere state licensing exam. In the final hour, some candidates had comfortably completed their designs, putting the finishing touches on the last sheets of their work. Then there were those miserable unfortunate souls who realized that they still had three hours of work remaining, but only sixty, then forty-five, then thirty minutes before the alarming buzzer sounded. There were screams and shrieks at the frantic conclusion. For many, a cloud of panic and dread filled the arena. 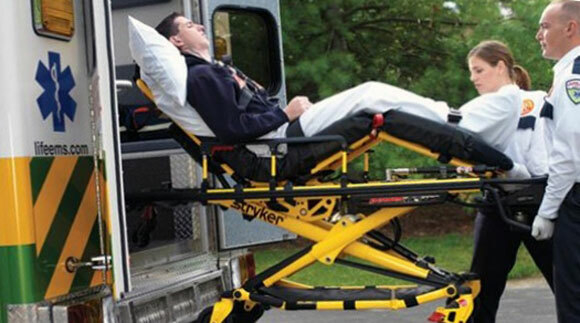 Drawings were torn in great violence, furniture was thrown across the room, and the uniformed, white-gloved paramedics rushed to aid the sad examinees who gave up, shriveling under pressure. Watching young architects throwing up left and right is not a good sight. For any of the eight exams passed, we could check them off the list and edge closer to being real architects. The strategy was simple: Take the exams over and over again until all of them were passed. Right? But the exams were only offered once a year, except for the final design exam, which was offered twice a year so as to torture more people more often. Without perseverance, it could take years, even many years, to pass all the exams. After all the education and internships, after passing all eight written exams, I still had the Oral Exam before me. Through the years, many states had eliminated this final dubious test. But during my time, California and New York kept the tradition alive, and it seemed more a questionable rite of passage than an exam. 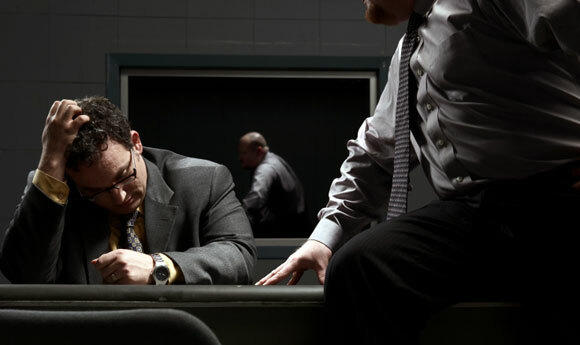 In a hotel room with a small dim spotlight and glass of water, three senior architects would ask questions as if a searing interrogation—much like a poorly shot scene in a police TV drama. Back then, it was rumored that the passing rate of all exams on the first attempt was less than 5%. But I am still practicing.